This article is about the novel. For the film adaptations, see The Twilight Saga: Breaking Dawn – Part 1 and The Twilight Saga: Breaking Dawn – Part 2. For other uses, see Breaking Dawn (disambiguation). Unlike the series' previous two entries, Breaking Dawn received mixed reviews from critics. It is also the most controversial book of the series, as adult themes and concepts are explored more directly than in its predecessors. However, the novel was awarded the British Book Award for "Children's Book of the Year". It was translated in 38 languages with rights sold to over 50 countries. The book has been adapted into a two-part movie, with the first part released on November 18, 2011 and the second part released on November 16, 2012. Breaking Dawn is divided into three separate parts. The first part details Bella's marriage and honeymoon with Edward, which they spend on Isle Esme, a private island that Carlisle bought for Esme, off the coast of Brazil. Two weeks into their honeymoon, Bella realizes that she is pregnant with a half-vampire, half-human child and that her condition is progressing at an unnaturally accelerated rate. After contacting Carlisle, who confirms her pregnancy, she and Edward immediately return home to Forks, Washington, where the fetus continues to develop at an abnormal speed. The second part of the book is written from the perspective of Jacob Black, a werewolf who had also fallen in love with Bella. A month after the wedding, Bella calls her father, Charlie Swan, and says that she is sick. Charlie relays this to Billy Black, Jacob's father, and Billy relays it to the pack. Jacob thinks that Bella is now a vampire and attempts to lead an assault on the Cullens for breaking the treaty. When he arrives, he discovers that Bella is sick, but it is from her pregnancy, not a disease. Jacob begs Bella to abort the fetus and save her life, but Bella is determined that she will live long enough to have the baby and be transformed into a vampire. Jacob runs off in his werewolf form and keeps thinking of what Bella had said. This accidentally reveals Bella's condition to the pack, and because they think the baby will become a monster, the pack decides to kill the baby and Bella immediately. Jacob refuses, and when Sam uses an alpha command to force Jacob, Jacob accepts his bloodline as the true leader of the pack and breaks free of Sam's control. He runs off to warn the Cullens of the pack's plan to kill Bella. However, while en route, Seth Clearwater, one of the younger pack members, joins Jacob and makes note of the fact that neither of them can hear the others' thoughts and that they had formed their own pack. They warn the Cullens and take up patrol around the Cullens' property. Leah, Seth's older sister, joins them shortly afterward. After a chance remark by Jacob, they discover that the baby simply craves blood, and Bella has to drink it out of a cup for the greatest effectiveness. Bella gets better, but the fetus grows swiftly and the timing of birth is unknown due to the lack of any related medical knowledge on human-vampire births. Carlisle, the experienced doctor, is out of the house to replenish blood supplies from a hospital blood bank when Bella falls, detaching the placenta and inducing labor. The baby breaks many of her bones, including her spine, and she loses massive amounts of blood. In order to save her life, Edward changes her into a vampire by injecting his venom into her heart. Jacob, thinking that Bella is dead, and blaming Bella's daughter Renesmee as the cause, tries to kill Renesmee. Instead, he "imprints"—an involuntary response in which a shape-shifter finds his soul mate—on her. The third section shifts back to Bella's perspective, describing Bella's painful transformation, waking to find herself changed into a vampire and enjoying her new life and abilities. However, the vampire Irina misidentifies Renesmee as an "immortal child," a human child who has been turned into a vampire. Because immortal children are uncontrollable, creating them has been outlawed by the Volturi. After Irina presents her allegations to the Volturi, they plan to destroy Renesmee and the Cullens. In an attempt to survive, the Cullens gather other vampire clans from around the world to stand as witnesses and prove to the Volturi that Renesmee is not an immortal child. Edward telepathically connects with Jacob and his Quileute pack, with the full realization of Jacob's imprint on Renesmee forging a new family connection of an unbreakable bond and mutual pact of protection between the Cullens and the Quileute, ending hatred between the races. As local and foreign vampires arrive, the Cullen house becomes the headquarters and training ground for the assorted vampires and the Quileute wolf packs. Bella's human ability shielded her from psychic powers, but as a vampire she learns she can project it to shield others in a wide radius, a secret weapon that neutralizes the Volturi's powers. Upon confronting the gathered Cullen allies and witnesses, the Volturi discover that they have been misinformed on Renesmee's identity, and execute Irina when she refuses to make a claim against the wolves for killing Laurent, trying unsuccessfully to instigate a full battle. Additionally, Caius brings up the Cullens' pact with the Quileute as allying with the vampires' sworn enemy, the Children of the Moon, but it turns out the Quileutes are "shapeshifters" that chose the form of giant wolves, and not Lycans. The Volturi remain undecided on whether Renesmee should be viewed as a threat to vampires' secret existence. At that time, Alice and Jasper, who had left prior to the gathering of the Cullen's allies, return with a Mapuche called Nahuel, a 150-year-old vampire-human hybrid like Renesmee, and his biological aunt, Huilen. Huilen tells of how her sister fell in love with a vampire and became pregnant with his child. She also shares that when Nahuel was born, he bit her and made her immortal. Nahuel demonstrates that the hybrids pose no threat, and the Volturi agree to leave the Cullens alone. Before the Volturi leave, he also informs them of his father's intent to create more hybrids to produce a "super race." While allowing them to deal with his father, Nahuel begs the Volturi to spare his sisters. The Cullens and their allies return to their homes in peace, accepting that the Volturi may one day return. When Edward and Bella are alone, she lets him read her mind for the first time, sharing her feelings about him from her memories. He asks to see her memories again, but she tells him it would take time to show him again. Edward reminds her not to worry, as they have eternity to spend together. Originally, Meyer wrote a book titled Forever Dawn, which was a direct sequel to Twilight. While the basic storyline remained the same, Forever Dawn was narrated completely from Bella’s point of view, the werewolves and Jacob were "only sketchily developed", Victoria and Laurent were both alive, and there was an epilogue. Meyer went on to say that she "may post some extras someday if I ever have time to go back through the Forever Dawn manuscript—it's just as long as Breaking Dawn." The part that took Meyer the longest time to write of Breaking Dawn was the half-chapter describing the 3 months after Bella's transformation into a vampire because "the amount of time per word put into that section was probably ten times what it was in any other part of the book" and Meyer liked to write minute by minute, but didn't think it would be exciting. Meyer decided to include the pregnancy in her story while she was researching vampires, early in 2003, and came across the legend of the incubus, a demon who could father children. Bella's insistence to not let her child die was inspired by Meyer's reaction when asked if she would let one of her children die so she could live, which was to deliver the child no matter what the consequences were. Meyer said in an interview with Shannon Hale, published in The Twilight Saga: The Official Illustrated Guide, that the birth scene published is a little less grotesque than the one she wrote before editing due to her editor, agent and publisher's requests to "tone down the violence a little". She stated that Bella's pregnancy and childbirth, for her, were "a way to kind of explore that concept of what childbirth used to be" in the past and acknowledged that they were "taking Bella in a new direction that wasn't [as] relatable for a lot of people." Concerning the subject of the relatability of Bella, Meyer admitted that she lost some of her relatability to the character when she became a vampire and said, "every point up until that point in the story [the transformation] I would say I could step into this story right here and I could do everything she could do which made it really fun." Meyer wanted to experience Bella's vampiric experiences and "enjoyed very much" writing about them and wanted to end the book from her perspective, but still thought it was "a little bit harder" as she couldn't step in into the story anymore. In regard to Renesmee's unique name, Meyer wrote that she "couldn't call her Jennifer or Ashley. What do you name the most unique baby in the world? I looked through a lot of baby name websites. Eventually I realized that there was no human name that was going to work for me, so I surrendered to necessity and made up my own." The plays The Merchant of Venice and A Midsummer Night's Dream by William Shakespeare both influenced Breaking Dawn. Meyer decided that Alice would write her instruction to Bella on a page from The Merchant of Venice to give a clue that the final confrontation at the end of the book would be a mental one—not a physical battle—like the one at the end of the play. It also hints that the novel would have a happy ending for the couples, as in The Merchant of Venice. Originally it was the novel Jane Eyre by Charlotte Brontë that Alice tore a page from, but Jane Eyre had nothing to do with the story, so Meyer changed it. The idea of imprinting, which existed in Forever Dawn, was inspired by A Midsummer Night's Dream. Meyer described it as "the magic of setting things right—which doesn't happen in the real world, which is absolutely fantasy", and decided to introduce it earlier–in Eclipse–so she wouldn't have to explain it later. Meyer described the cover as "extremely meaningful" and said that she was "really happy with how it turned out". 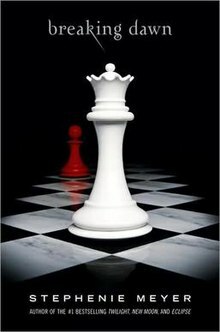 The cover is a metaphor for Bella's progression throughout the entire series; she began as the physically weakest player on the board, the pawn, but at the end she becomes the strongest, the queen. The chessboard also hints at the conclusion of the novel "where the battle with the Volturi is one of wits and strategy, not physical violence." The title, Breaking Dawn, is a reference to the beginning of Bella's life as a newborn vampire. Wanting to add a "sense of disaster" to the title to match the novel's mood, she called it Breaking Dawn. Another reason for giving the book this particular title is that it matches the book's plot, which centers on "a new awakening and a new day and there's also a lot of problems inherent in it". Critical reception of Breaking Dawn was mixed. Lev Grossman wrote, "First, since there's a lot of one-star reviews up on Amazon, let me say up front: I loved Breaking Dawn." Cara von Wrangel Kinsey of School Library Journal responded with a positive review, describing the book as "captivating" and noting, "While this novel is darker and more mature than the earlier titles, Meyer's twists and turns are not out of character." The Charlotte Observer agreed and called the book "pretty darned good", but criticized the book's length saying, "I wish [Stephenie Meyer] hadn't felt compelled to pack so much into one volume. It should have been two books." Mary Harris Russell of the Chicago Tribune also responded with a positive review and hailed the book as a "fun read", noting that Stephenie Meyer "continues to produce witty writing about families, teenagers and popular culture", while Time called the book "a wild but satisfying finish to the ballad of Bella and Edward" and gave it a rating of A-. An article in The Daily News Tribune said of Breaking Dawn, "Some of the dialog is a bit stilted,... but, if you stay close to Meyer's rich and prodigious narrative, you too might fall in love with its suspense and moving sensitivity". Publishers Weekly stated that the main problem with Breaking Dawn was that, "Essentially, everyone gets everything they want, even if their desires necessitate an about-face in characterization or the messy introduction of some back story. Nobody has to renounce anything or suffer more than temporarily—in other words, grandeur is out." In an article by The Associated Press, journalist Sara Rose wrote on NewsOK.com that fans of the series would love "engaging characters, great humor, a distracting obsession with beauty, focus on the minutiae of emotions"; however "casual readers may be disappointed with a lot of build-up and little action." The Independent called the book, "shockingly, tackily, sick-makingly sexist" and said that "Bella Swan lives to serve men and suffer." Entertainment Weekly graded Breaking Dawn with a D, criticizing the birth scene and Bella's "unwavering passion for Edward" and having no other goals. The Washington Post also responded with a negative review, making comments such as, "Meyer has put a stake through the heart of her own beloved creation," and "Breaking Dawn has a childbirth sequence that may promote lifelong abstinence in sensitive types." In an interview with Entertainment Weekly, Meyer responded to the negative response of many fans to the book and called it the "Rob Effect"; she said that the fans need time to accept the ending of Breaking Dawn, just as they needed time to accept Robert Pattinson playing the role of Edward in the Twilight movie. Breaking Dawn was the recipient of a British Book Award for "Children's Book of the Year". In the 2009 "Children's Choice Book Awards", the novel was chosen as "Teen Choice Book of the Year" and Meyer won the "Author of the Year" award. Summit Entertainment announced in November 2008 that they had obtained the rights to the fourth book in Stephenie Meyer's series, Breaking Dawn. The studio greenlit an adaptation of The Twilight Saga: Breaking Dawn in April 2010. The film was split into two parts; the first part of the film was released on November 18, 2011, and the second part was released on November 16, 2012. Bill Condon directed both parts; Stephenie Meyer co-produced the film along with Karen Rosenfelt and Wyck Godfrey. In July 2010, Summit announced that the film would be shot in Vancouver, Canada, and Baton Rouge, Louisiana. Maggie Grace plays the part of Irina in the film, while Mackenzie Foy plays Renesmee, Edward and Bella's half-vampire, half-human child. The infant Renesmee was portrayed by a robot. It was filmed at the Canadian Motion Picture Park Studios (CMPP). The film did not follow the book strictly, as many of the scenes were created from scratch to add tension to the narrative. ^ a b c Dan Glaister & Sarah Falconer (2008-07-20). "Mormon who put new life into vampires". London: The Observer. Retrieved 2009-09-19. ^ a b c d Jim Milliot (2008-08-04). "'Breaking Dawn' Breaks Hachette Records". Publishers Weekly. Archived from the original on 2008-12-17. Retrieved 2008-10-18. ^ "Forever Dawn". StephenieMeyer.com. Retrieved 2008-09-07. ^ a b c d e f "Breaking Dawn FAQ". StephenieMeyer.com. Retrieved 2008-09-07. ^ Meyer, Stephenie (April 2011). "A Conversation with Shannon Hale, On Finding Story Ideas". The Twilight Saga: The Official Illustrated Guide. Little, Brown and Company. ISBN 978-0-316-04312-0. ^ a b "The Breaking Dawn Concert Tour-Chicago Q&A". Twilight Lexicon. Retrieved July 6, 2011. ^ Meyer, Stephenie (April 2011). "A Conversation with Shannon Hale, On Breaking Dawn". The Twilight Saga: The Official Illustrated Guide. Little, Brown and Company. ISBN 978-0-316-04312-0. ^ a b "The Breaking Dawn Concert Tour-Seattle Q&A". Twilight Lexicon. Retrieved July 6, 2011. ^ "Twilight Series - Breaking Dawn - FAQ". StephenieMeyer.com. Retrieved June 1, 2011. ^ Meyer, Stephenie (April 2011). "A Conversation with Shannon Hale, On Literary Inspirations". The Twilight Saga: The Official Illustrated Guide. Little, Brown and Company. ISBN 978-0-316-04312-0. ^ a b "Breaking Dawn Concert Tour-Los Angles Q&A". Twilight Lexicon. Retrieved July 7, 2011. ^ Meyer, Stephenie (April 2011). "Frequently Asked Questions". The Twilight Saga: The Official Illustrated Guide. Little, Brown and Company. ISBN 978-0-316-04312-0. ^ "EW.com Excerpt". Entertainment Weekly. 2008-08-05. Retrieved 2008-09-07. ^ "Breaking Dawn Quotes". StephenieMeyer.com. Retrieved 2008-09-07. ^ "Breaking Dawn Release Party". StephenieMeyer.com. Retrieved 2008-09-07. ^ Lauren Wilson (2008-07-31). "Teens clamoring for the next 'Twilight' book". OC Register. Retrieved 2009-09-19. ^ "Twilight Chocolate". MTV. Retrieved 2008-09-07. ^ Elizabeth Fox (2008-07-29). "'Twilight's' last gleaming". The Philadelphia Inquirer. Archived from the original on 2008-08-22. Retrieved 2008-09-10. ^ Maxine Shen (2008-07-13). ""Twilight" vamps it up". New York Post. Retrieved 2008-09-10. ^ "Breaking Dawn wins Children's Book of the Year Galaxy British Book Award for Stephenie Meyer". Little, Brown. Retrieved 2009-09-19. ^ Alison Flood (2008-09-23). "Dream sales for new children's fantasy". London: The Guardian. Retrieved 2009-09-19. ^ "Disappointed Breaking Dawn fans organize protest". CBC News. 2008-08-08. Retrieved 2009-09-19. ^ "This week's top 150 best sellers". USA Today. 2009-09-13. Retrieved 2009-09-19. ^ Diane Roback (2009-03-23). "Bestselling Children's Books 2008: Meyer's Deep Run". Publishers Weekly. Archived from the original on October 8, 2012. Retrieved 2009-09-19. ^ "Breaking Dawn Special Edition". Amazon.com. 2009-08-04. Retrieved 2009-11-15. ^ Lev Grossman (2008-08-04). "Twilight of the Idols: The Breaking Dawn Review (spoilers)". Time. Retrieved 2009-09-19. ^ Cara von Wrangel (2008-08-11). "Breaking Dawn by Stephenie Meyer". School Library Journal. Retrieved 2009-09-19. ^ Lilah Lohr (2008-08-12). "Last 'Twilight' bite has lots to chew on". The Charlotte Observer. Retrieved 2009-09-19. ^ Mary Harris Russell (2008-08-09). ""Breaking Dawn," by Stephenie Meyer". Chicago Tribune. Retrieved 2009-09-19. ^ "Breaking Dawn". Time. 2009-08-07. Retrieved 2009-09-19. ^ Margaret Smith (2008-08-12). "Sun sets on 'Twilight Saga' series with engaging fourth novel". The Daily News Tribune. Retrieved 2008-09-07. ^ "Publishers Weekly review". Amazon.com. Retrieved 2008-09-07. ^ "NewsOK.com article". NewsOK.com. Retrieved 2008-09-07. ^ "The heroine of this vampire tale is woefully anaemic". London: The Independent. 2008-09-07. Retrieved 2008-09-07. ^ "EW Review". Entertainment Weekly. 2008-08-08. Retrieved 2008-09-07. ^ Hand, Elizabeth (2008-08-10). "Washington Post Review". The Washington Post. Retrieved 2008-09-07. ^ "First looks". EW.com. Retrieved 2008-09-07. ^ Hephzibah Anderson (2009-04-03). "Obama's 'Dreams,' Meyer's Vampires Capture 'Nibbie' Book Awards". Bloomberg.com. Retrieved 2009-04-11. ^ "Children's Choice Book Award Winners Announced". Children's Book Council. 2009-05-13. Archived from the original on May 15, 2009. Retrieved 2009-05-14. ^ Steven Zeitchik (2008-11-14). "'Twilight' film franchise looks ahead". The Hollywood Reporter. Archived from the original on December 4, 2008. Retrieved 2008-12-13. ^ "Breaking Legal News & Entertainment Law Blog - THR, ESQ". Thresq.hollywoodreporter.com. Archived from the original on 2010-05-14. Retrieved 2011-06-19. ^ "Our Twilight Chronicles: Final Installment of Breaking Dawn Release Date: 11/16/12 - Yikes!". Ourtwilightchronicles.blogspot.com. 2010-08-06. Retrieved 2011-06-19. ^ Nicole Sperling (2010-04-28). "It's official: Bill Condon will direct Breaking Dawn". Entertainment Weekly. Archived from the original on 2010-04-29. Retrieved 2010-04-28. ^ "Mackenzie Foy & Maggie Grace to Play in The Twilight Saga: Breaking Dawn". TheNewsOfToday.com. 2010-09-28. Archived from the original on 2010-10-02. Retrieved 2010-09-28. This page was last edited on 28 January 2019, at 08:00 (UTC).